Zoogeographical region is a branch of biogeography that comprises distribution of animal species on some particular basis. Different animal species adapt themselves to particular environmental conditions. Not all the regions of world comprise same species of fauna and avifauna. Classification of zoogeographical region is essential to know about as it would let us know which regions of the world comprise what type of fauna staff. The presence of variety of animals of varying species of the zoogeographical region, on this planet earth is based on certain causes. Their movement on different regions of the earth on some specific basis has resulted to the concept of Classification of zoogeographical region. In the year 1876, A.R Wallace and Charles Darwin, made an advancement of the theory of 'Natural Selection' which is related to the zoogeographical region on a close basis. Each region got separated from it's neighbouring region by different barriers, that resulted into the Classification of zoogeographical region. 1. Arctogea - This zoogeographical region comprises North America, Northern part of old world, Greenland, Africa and South East Asia. It provides highest number of mammals and specialized birds. The primitive form of animals is very few in number in this region. Faunal similarity is very high, despite of climato - morphometric diversity. This region is categorised into three regions and that is Holarctic, Ethiopian and Oriental. (i) Holarctic region - This region comprises North America, small strip of North Africa, Europe and Northern part of Asia. It provides high number of specialized placental mammals. The animals are well adapted to the Post Pleistocene geographical conditions, which makes this region unique. This region is sub - divided into two regions Palearctic and Nearctic. 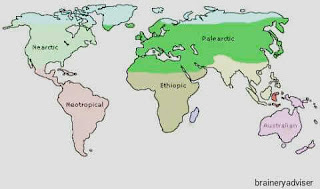 a) Palearctic region - This region comprises the northern part of old world that is Mediterranean Africa, Europe, Northern Arabia and Asia except areas of Himalayas and Tyanshan ranges. It provides 28 land mammal families. Beer and deer families are restricted. The number of reptiles, lizards, snakes and tortoise are less. Dogs ans rabbits are found worldwide The Tundra region occupies reindeer, polar bear, walrus. The deciduous region occupies bears, fox, squirrels. Moreover, herbivores like cows, goats, horse, sheep etc and carnivores like tiger, leopard etc are also found. b) Nearctic region - This region comprises the same fauna staff of the Tundra region of Palearctic. North America was the home of horses but has vanished now. In the same way, northern part of North America was the home of camel which have now migrated to Asia and South America. (ii) Ethiopian region - This region comprises Africa, Madagascar and Southern Arabia. It provides 38 mammal families except the birds. It received its fauna staff from Oriental or Holarctic region. Giraffe, hippopotamus, chimpanzee and many more vanished from Asia. The important herbivores are zebra, elephant, rhinoceros and gnuns. The important carnivores are lion, jackal, fox and hyena. (iii) Oriental region - This region comprises India, southern China and south - east Asia. The movement of animals is highly restricted in this region due to the presence of barriers like Himalayan ranges. The fauna and avifauna staff of this region is same as the Ethiopian region. Such similarities are due to their respective tropical location and climate. Some of the important mammals are monkeys, apes, elephants, rhinoceros, buffalo, deer and tiger. Snakes, lizards, carp fishes and numerous birds are also found. 2. Neogea - This region comprises the entire part of Central America and South America. Topographical diversity can be found here. It provides 32 mammal families except bats along with high number of endemic families. Amongst the 32 mammal families 16 have unique occurrence and others are of worldwide occurrence. Deer, cat, bear, weaser, camel, frog, turtle and snake are among the highly distinctive fauna staff of this region. 3. Notogea - This region is categorised into Australian and Polynesian Hawaiian regions. This region is clearly defined among the others. (i) Australian region - This region comprises New Guinea, Australia, Tasmania and eastern Indonesian islands. In the late Paleozoic period, the fauna staff made it's migration from Asian landmass, before Australia got drifted from the old world. The marsupial animals comprising of 6 families are dominant in this region.Wallaby, koala, mole, kangaroo and jumping mouse are the important among the fauna staff. Platypus and echidna are important among the egg laying mammals. It has same avifauna staff like the Oriental region. (ii) Polynesian Hawaiian region - This region comprises numerous scattered Pacific islands. The amphibians and land mammals are completely absent. The population of birds is high in number. The island fauna have a tendency to endemism, tendency of flying form to loose their use of wings and tendency of dwarfing. These were the main regions of the Classification of zoogeographical region. This has resulted from very early period, mainly from Pleistocene ice age. Now at present, this regions comprising of specific fauna staff holds up high significance.